The vision of Higher Ground Ministries is to call, train, equip, empower and release outreach ministers to the glory of God. 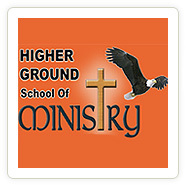 HGSM offers a unique ministry training experience with an emphasis on full gospel, evangelical and ecumenical Christian ministry. Higher Ground Ministries is a full gospel ministry committed to lifting up the name of Jesus, meeting specific needs and winning the lost through Spirit-led outreaches and the training of outreach ministers.